Wash and clean the vegetables well. Cut into cubes. Lightly fry the aubergines, courgettes, peppers and place on absorbent paper. In a skillet sauté the onion in a little olive oil, add the wine and the tomatoes to make a runny mixture. Arrange the lightly fried vegetables in a baking tin and pour over the tomato mixture. 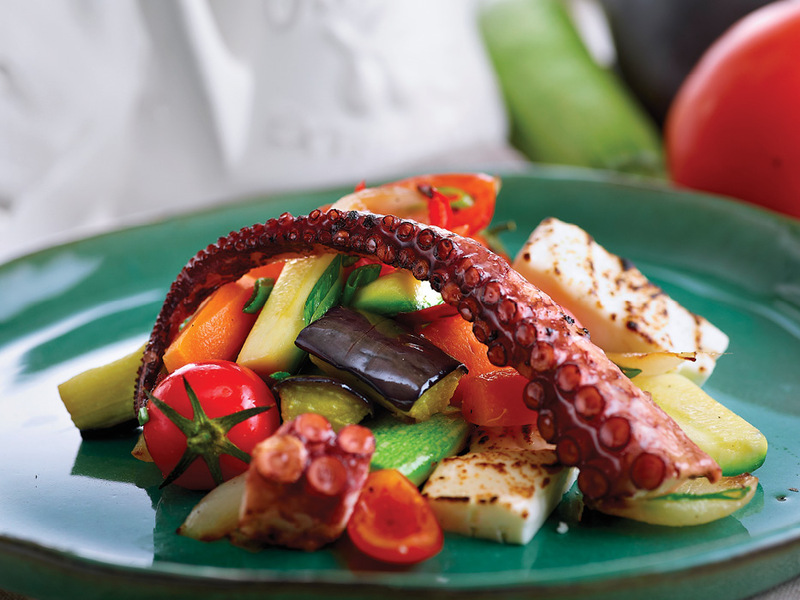 Boil the octopus tentacles with the herbs and a little olive oil until almost cooked, place it over the vegetables and finish off in the oven for 15-20 min at 1800C. Just before it is ready, add the feta. * Sofegada is the Cretan name for vegetable stew, tracing back to the Venetian Era. Sofegada has no restrictions in the ingredients used. In the old times, when people lived on seasonal products only, in order to cook enough food for the whole family, they had to use all the remaining vegetables and herbs they could find in their garden.